Adjusting a ring size may not be as complicated as you think. In many cases it is possible for small adjustments to be made without the need for soldering and larger adjustments can be made using basic soldering skills. On this page we share the different options available when needing to make a ring either smaller or larger. Any adjustments in size are best carried out on ring blanks (before any stones have been set in them) so always try to accuarately size rings before you add any gemstones as this makes the whole process much easier. We have included some advice on adjusting rings with stones set in them further down the page. 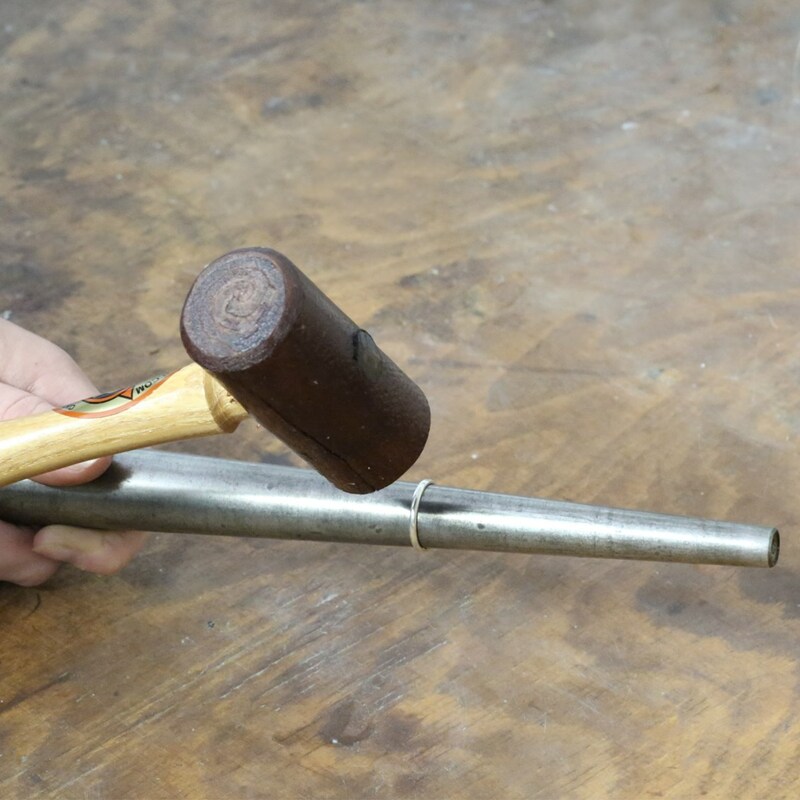 If a ring only needs to be increased by a size or two it can often be adjusted using a triblet and rawhide mallet. 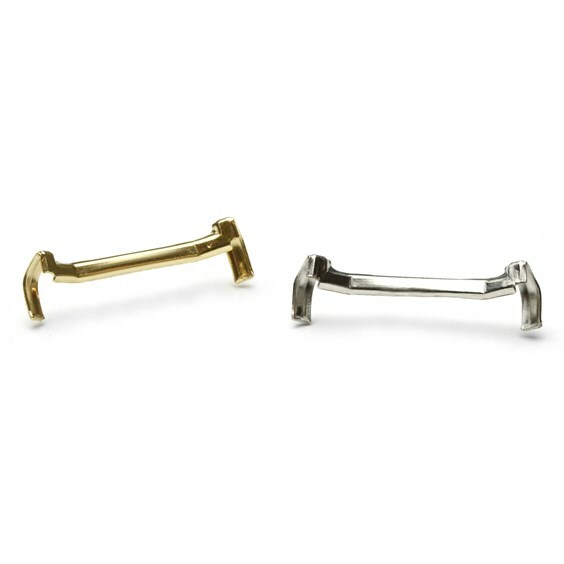 The triblet ensures that the band keeps its shape and the rawhide mallet will not mark your metal as the head is made from leather. Simply put the ring onto the triblet - if your ring has a claw or bezel mount place your finger over it to protect it. Use the rawhide mallet to strike the metal around the back of the band. Do this in a downwards motion if possible so that the ring is pushed further down the triblet and the metal stretches to the size required. Frequently turn the ring (take it off the triblet and replace it the other way up) to ensure that the metal stretches evenly. Keep checking the size on a wheatsheaf ring size stick until the desired size is achieved. There will be very little re-polishing to do after this thanks to the rawhide mallet. A quick buff with rouge on a polishing mop will easily restore the sparkle or if you do not have an electric multi tool then use polishing papers or a polishing cloth. A piece of metal will need to be inserted in the shank (the band around the back of a ring). Using a saw simply cut the band right at the back - be sure to look out for any hallmarks which could be accidentally filled with solder. You may wish to insert the piece of metal slightly away from these in order to preserve them. Take a suitably sized piece of metal, trying to match the cross-section as closely as possible (e.g. D-shape wire, rectangular wire, round wire or sheet metal). It is likely that you will only need a small piece so it is always worth a search in your scrap pot first. Once you have obtained a suitable piece, this will need to be inserted and soldered in place. As the band will inevitably lose its shape during the solder work it, you will need a rawhide mallet and a triblet to knock it back into shape again before re-polishing it. If you need a ring to be made smaller without having to cut and solder it, there is the option of using a ring size adjuster which neatly and discreetly bends around the band at the back to make the finger hole smaller. These are particularly useful if you have gemstones set into your ring which would need to be protected from heat (or even removed) during soldering. If you want to make a more permanent adjustment, you will beed to remove a small piece of the band from the back using a saw and solder is the ring back together again with solder paste. Again, take care to avoid losing any hallmarks by thinking carefully about where you remove the piece of metal from. As the band will inevitably lose its shape, you will need a rawhide mallet and a triblet to knock it back into shape before polishing it. If your ring has gemstones set into it this can make adjusting the size a little more complicated as gems can be damaged by heating. If you do need to resize your ring using a solder it is advisable to always use a heat barrier such as thermo-gel. This gel helps to protect the stones and areas your do not want the heat to get to. Stones which are particularly hard and therefore score highly on the Mohs scale such as diamonds, rubies and sapphires can often be heated without worry but care must be taken to heat and cool them slowly to avoid fractures which can give a `crackled` appearance. Softer stones will need to be removed before soldering the ring as they are very likely to be damaged.